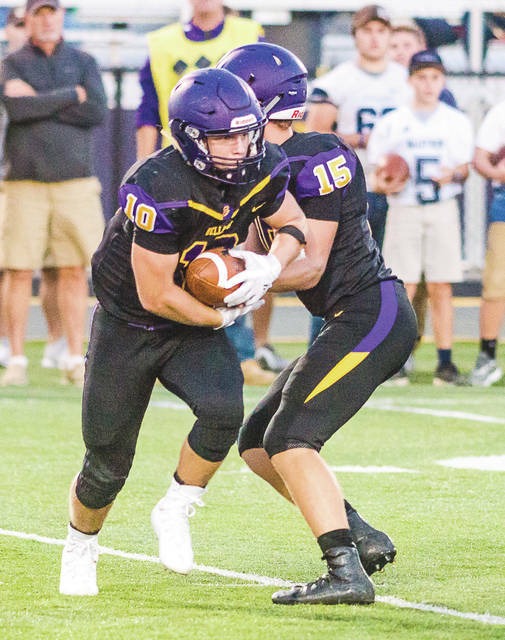 Bellbrook quarterback Brendan Labensky (15) hands off to running back Ethan Savey (10) in last week’s high school football game. The Golden Eagles are fourth in their Division III region and remain in the playoff hunt. COLUMBUS — The Ohio High School Athletic Association released its weekly football computer ratings Tuesday afternoon. The weekly computer ratings are released every Tuesday beginning in the fifth week of the season, leading up to the final report on Sunday morning, Oct. 29, when 224 schools will official qualify for the playoffs. Of the 719 OHSAA member schools playing varsity football this fall, the largest 72 schools are in Division I, while the remaining schools are divided equally in Divisions II through VII (approximately 108 schools in each division). Ratings for teams in Greene County regions. Top eight schools from each region in the final report Oct. 29 will qualify for the playoffs. Region 28 – 1. Convoy Crestview (5-1) 8.65, 2. Delphos St. John’s (4-2) 8.4167, 3. Sidney Lehman Cath. (5-1) 7.6167, 4. Minster (3-3) 5.9833, 5. Cin. Miami Valley Christian Acad. (4-2) 5.4064, 6. DeGraff Riverside (4-2) 5.3667, 7. Fort Loramie (4-2) 5.3434, 8. Cin. Gamble Montessori (4-2) 4.4711, 9. Springfield Cath. Central (3-3) 3.5328, 10. Lima Perry (3-3) 3.5, 11. New Bremen (3-3) 2.5833, 12. Lockland (2-3) 2.5091; ALSO — 24. Cedarville (0-6) 0.0000. Ratings courtesy of the Ohio High School Athletic Association.